G4G reader Dennis alerted me to a story by the Golf Channel’s Adam Barr about the need for rough on golf courses. Barr argues the game of golf is difficult enough without rough, and generally I agree. it too, and then hack it out of grass that feels like steel wire in a bad mood? ThatÃ¯¿½s too much. And if rough is so necessary to good golf, then why did Augusta National stand up to the worldÃ¯¿½s best for generations without it? Add the strategy layer: rough doesnÃ¯¿½t help there, either. Behr opined that rough cramps the architectÃ¯¿½s style in creating future threats, because the next shot out of rough is often an escape, not an intelligent or courageous negotiation of a hazard or challenge further along the hole. Ã¯¿½The golf architectÃ¯¿½is not at all concerned with chastising faulty strokes. It is his business to arrange the field of play so as to stimulate interest,Ã¯¿½ Behr wrote. Thanks Dennis for pointing this out and the whole story can be located here. So Stephen Ames is in — at least for the time being. Ames, who wasn’t scheduled to play the Accenture Match Play this weekend, will tee it up against Tiger Woods. Mike Weir takes on Stewart Cink. My pick? How about a resurgent Tom Lehman, who takes on Stuart Appleby in the first round. Apparently Lehman also thinks he might be able to make the Ryder Cup team that he is already captain of. 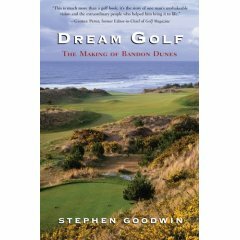 I’ve spent the last few nights reading Dream Golf, a book by Stephen Goodwin on the creation of Bandon Dunes by American greeting card magnate Mike Keiser. The book isn’t out for another month, but it is among the most fascinating golf reads I’ve been through in some time. It is partly about golf architecture, partly about business and the business of golf. It also details one man’s vision in the face of long odds. Needless to say Bandon and Pacific Dunes are among the most fascinating golf experiences I’ve had in my lifetime — and there isn’t much rough in play on either course. I played both of the first two courses twice when I was there two years ago, just as the third, the now heralded Bandon Trails, was growing in. I was on the phone with Keiser recently for a story I’m working on and he said there are plans for an additional two courses. And of course Keiser has been spotted scouting a location on the Saskatchewan/Alberta border. He said the property was “better than Sand Hills,” the courses in Nebraska which is in the Top 10 in the World, according to Golf Magazine. Previous postFred booms all over himself, Tiger WDs, and RBC out of CanOpen?